Showing items in category Nyasaland, sorted by newest listed first. 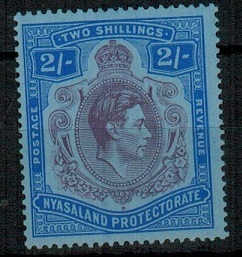 NYASALAND - 1894 FOUR in black on 2d ultramarine RPSE (size H2) unused. H&G 4a. 1894 FOUR in black on 2d ultramarine on cream registered postal stationery envelope (size H2) (minor flap crease) with 32mm 'R' in unused condition. H&G 4a. NYASALAND - 1894 FOUR in black on 2d ultramarine on cream RPSE unused. H&G 4. 1894 FOUR in black on 2d ultramarine on cream registered postal stationery envelope (size G) with 32mm 'R' in fine unused condition. H&G 4. 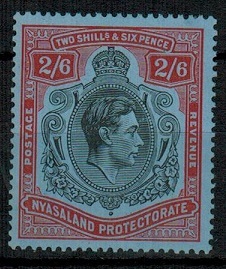 NYASALAND - 1892 2d ultramarine RPSE unused. H&G 1. 1892 2d ultramarine on cream registered postal stationery envelope (size G) with 28mm 'R' in fine unused condition. H&G 1. 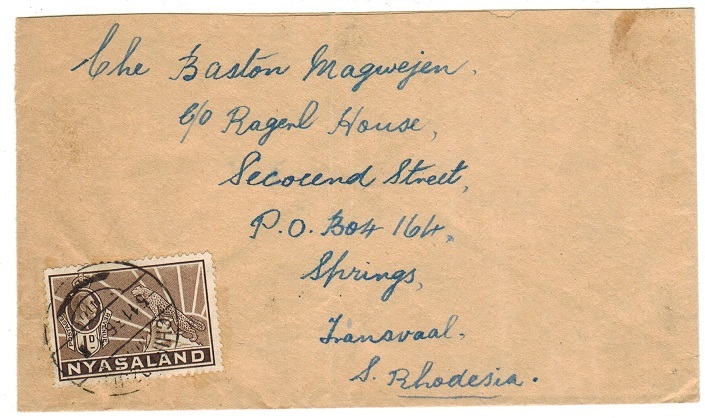 BASUTOLAND - 1934 inward 'unclaimed' first flight cover from Nyasaland. 1934 (APR.6.) inward first flight cover from Blantyre in Nyasaland with MASERU arrival cds. 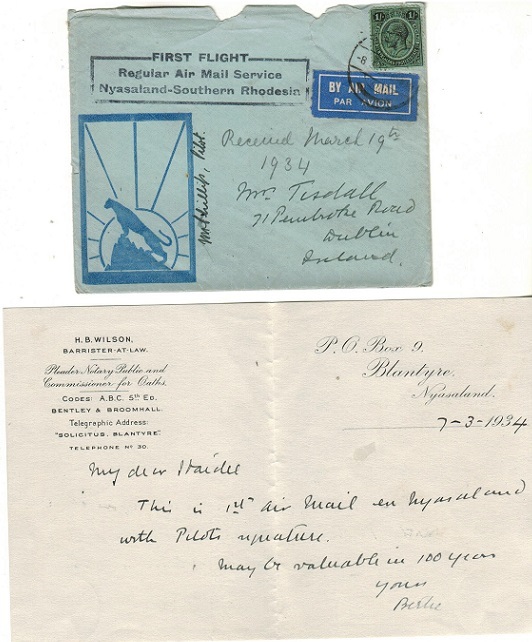 Struck by black boxed FIRST FLIGHT/REGULAR AIR MAIL SERVICE/NYASALAND-SOUTHERN RHODESIA handstamp. The cover was not claimed and returned. A rare stage to Basutoland. NYASALAND - 1935 'Silver Jubilee' first day cover used locally at LILONGWE. 1935 (6.5.) first day local cover bearing the 'Silver Jubilee' set of four (SG 123-26) tied by LILONGWE cds. Proud type D5. A scarce 'village' first day use of this difficult set. 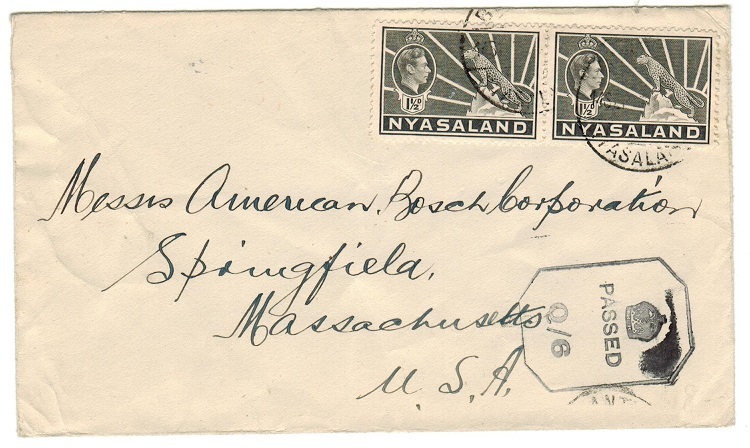 NYASALAND - 1934 first flight cover (ex flap) to Ireland. Pilot signed. 1934 (8.3.) 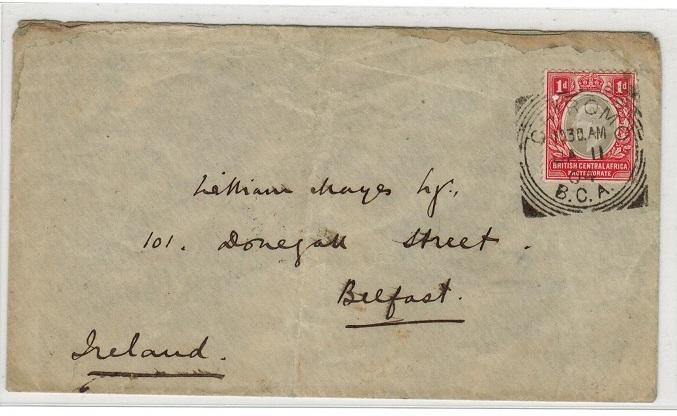 illustrated first flight cover addressed to Ireland (unusual) bearing 1/- adhesive tied by light BLANTYRE cds. The reverse flap is missing and the cover has been somewhat roughly opened at top but the cover is 'Pilot Signed' by Phillips. Complete with original contents. 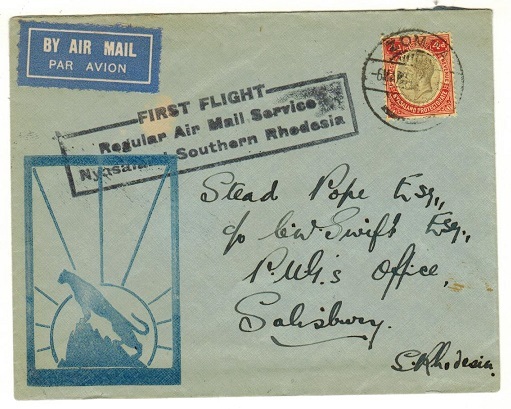 NYASALAND - 1934 first flight cover to Southern Rhodesia used at ZOMBA. 1934 (6.3.) illustrated first flight cover to Salisbury bearing 4d adhesive tied by ZOMBA cds and with black boxed FIRST FLIGHT/REGULAR AIR MAIL SERVICE cachet. 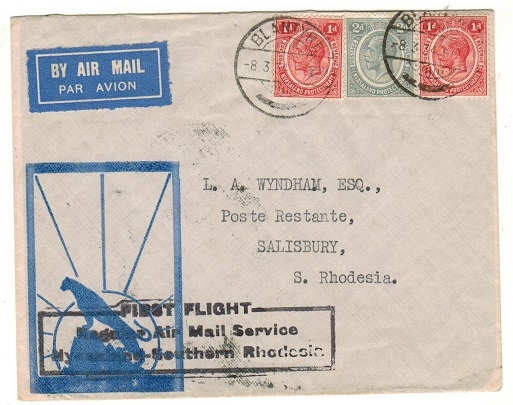 NYASALAND - 1934 first flight cover to Southern Rhodesia used at BLANTYRE. 1934 (8.3.) illustrated first flight cover to Salisbury bearing 1d (x2) and 2d adhesives tied by BLANTYRE cds's and with black boxed FIRST FLIGHT/REGULAR AIR MAIL SERVICE cachet. 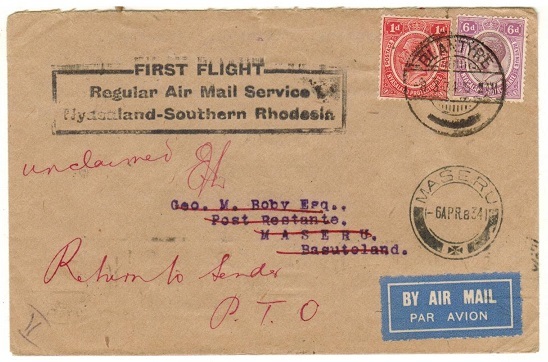 NYASALAND - 1935 first flight cover to Beira used at BLANTYRE. 1935 (AUG.5.) illustrated first flight cover addressed to Beira bearing 2d 'Silver Jubilee' adhesive pair tied BLANTYRE and with black boxed FIRST FLIGHT/REGULAR AIR MAIL SERVICE cachet applied. Flown by RANA with only 907 covers flown. NYASALAND (Malawi) - 1975 (circa) blue on cream 'FORMULA' RPSE (size G) unused. 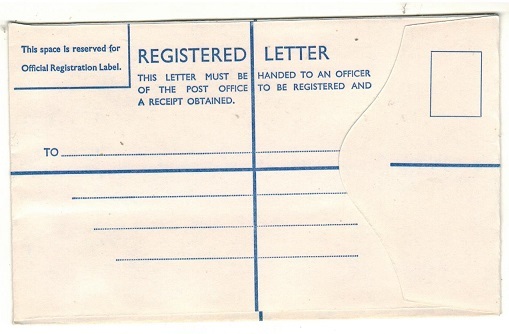 1975 (circa) blue on cream FORMULA registered postal stationery envelope (size G) in fine unused condition. NYASALAND (Malawi) - 1975 (circa) blue on cream 'FORMULA' RPSE (size H) unused. 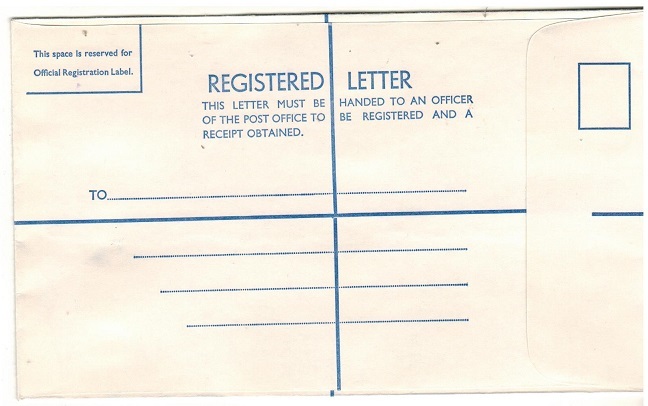 1975 (circa) blue on cream FORMULA registered postal stationery envelope (size H) in fine unused condition. 1951 (FEB.24.) use of dark blue on greyish blue FORMULA type air letter addressed to USA pre-printed O.H.M.S. at top and cancelled by ZOMBA/NYASALAND cds. An scarce official use by the Department of Agriculture. 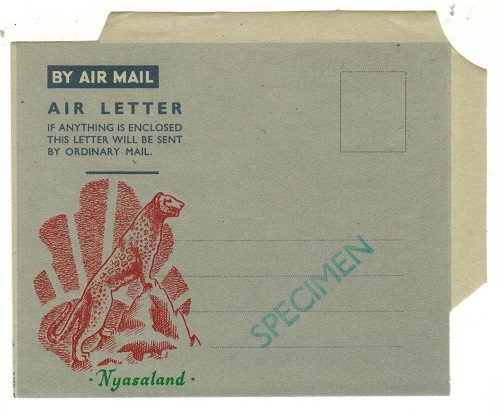 NYASALAND - 1947 (circa) 'Leopard' illustrated air letter handstamped SPECIMEN. 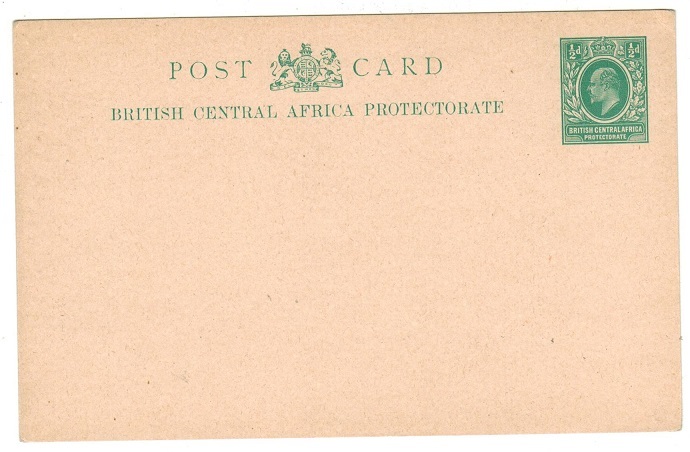 1947 (circa) dark blue on grey FORMULA postal stationery air letter in unused condition with red 'leopard' colony illustration applied with NYASALAND below in green and handstamped by diagonal SPECIMEN h/s in blue. NYASALAND - 1914 1/2d green PSC unused SPECIMEN. H&G 4. 1914 1/2d green on buff postal stationery postcard in unused condition with black diagonal SPECIMEN on front. H&G 4. 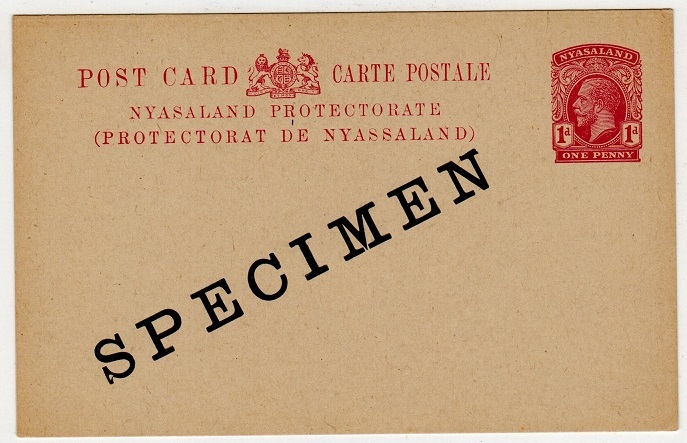 NYASALAND - 1914 1d red PSC unused SPECIMEN. H&G 5. 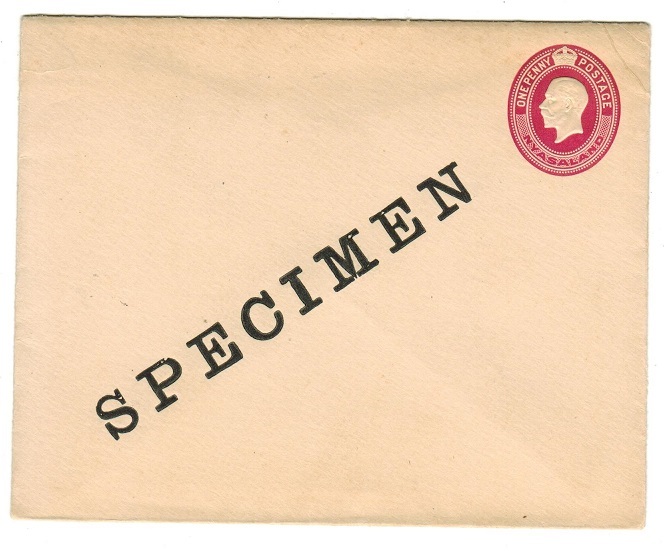 1914 1d red on cream postal stationery postcard in fine unused condition with SPECIMEN applied diagonally in black. H&G 5. NYASALAND - 1941 'PASSED BY CENSOR 15' 2d rate cover to USA used at BLANTYRE. 1941 (FE.17.) 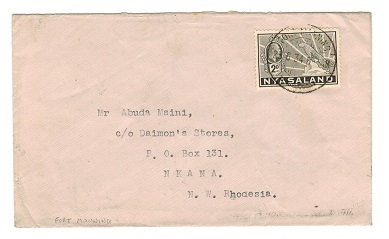 cover addressed to USA bearing 2d adhesive tied BLANTYRE/NYASALAND with black on cream OPENED BY CENSOR label at left tied on the front by circular PASSED BY/15/ CENSOR handstamp in violet. (Little type I). NYASALAND - 1898 1/2d green on cream PSC unused SPECIMEN. H&G 6. 1898 1/2d green on cream 'Internal' postal stationery postcard in fine unused condition with SPECIMEN applied diagonally in black on front. H&G 6. NYASALAND - 1946 OFFICIAL PAID/ZOMBA 'O.H.M.S.' cover to USA. 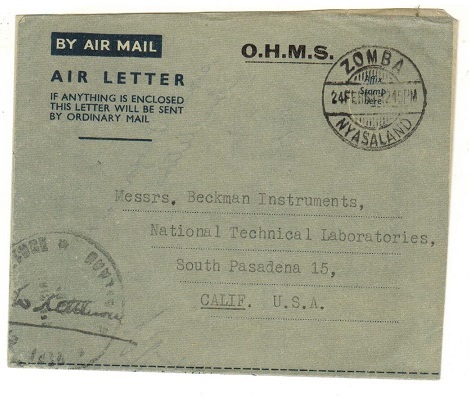 1946 (JUL.4) use of stampless OHMS envelope addressed to USA struck by oval POSTMASTER GENERAL/NYASALAND cachet at lower left & cancelled by OFFICIAL PAID/ZOMBA cds in red. 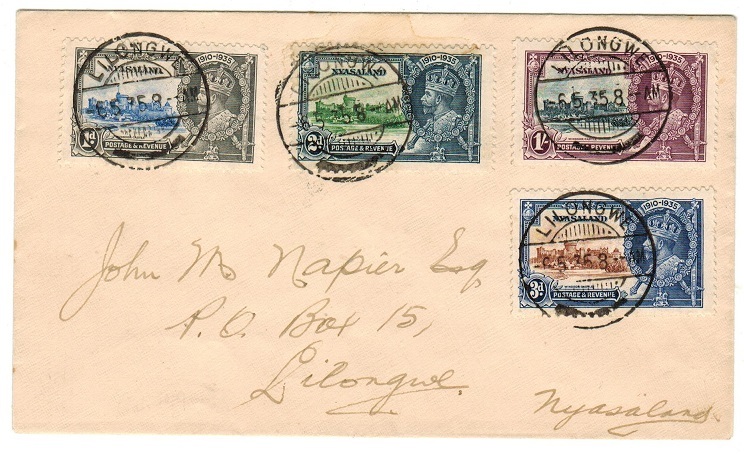 NYASALAND - 1893 2d ultramarine unused RPSE with '4d' surcharge in manuscript. H&G 3a. 1893 2d ultramarine on cream registered postal stationery envelope (size G) in unused condition (light ageing mainly due to arabic gum and small fault under flap due to adherence) with '2d pence' deleted in red manuscript and with '4d' added and signed by the postmaster alongside. Used as a temporary measure and very scarce. H&G 3a. NYASALAND - 1895 4d blue on cream RPSE unused. H&G 7a. 1895 4d blue on cream registered postal stationery envelope (size H2) in fine unused condition H&G 7a. 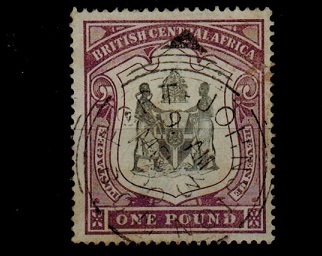 NYASALAND - 1897 £1 black and dull purple used. SG 51. 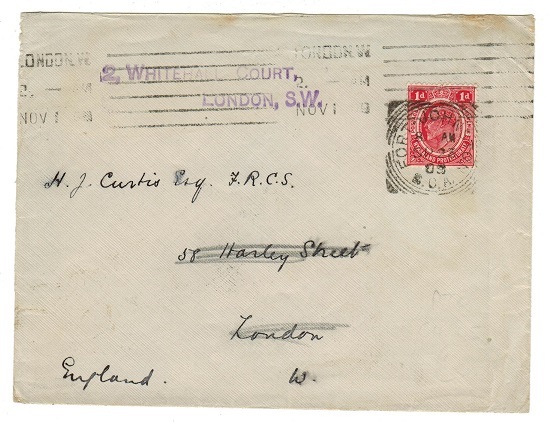 1897 £1 black and dull purple 'CC' watermark issue cancelled by squared circle FORT JOHNSTON/ BCA cancel dated MR.3.1900. SG 51. 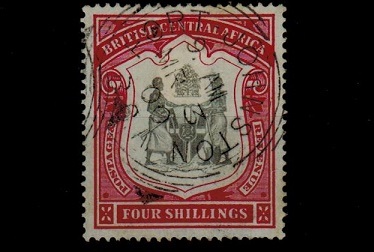 NYASALAND - 1897 4/- black and carmine used. SG 50. 1897 4/- black and carmine cancelled by fine squared circle FORT JOHNSTON/BCA cds dated MR.3.00. SG 50. 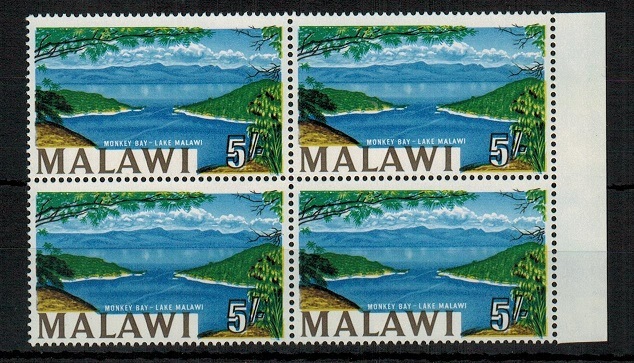 1965 5/- 'Lake Malawi' error in a fine unmounted mint marginal block of four (should read Lake Nyasa) and showing the MISPLACEMENT OF BROWN colour. SG 225a. NYASALAND (Malawi) - 1965 5/- 'lake' U/M with MISPLACED BROWN variety. SG 225a. 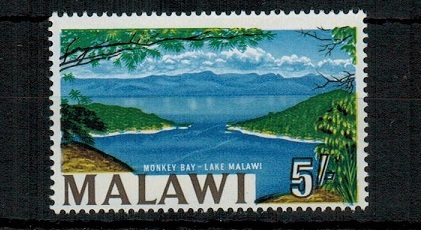 1965 5/- 'Lake Malawi' error in a fine unmounted mint example (should read Lake Nyasa) and showing the MISPLACEMENT OF BROWN colour. SG 225a. 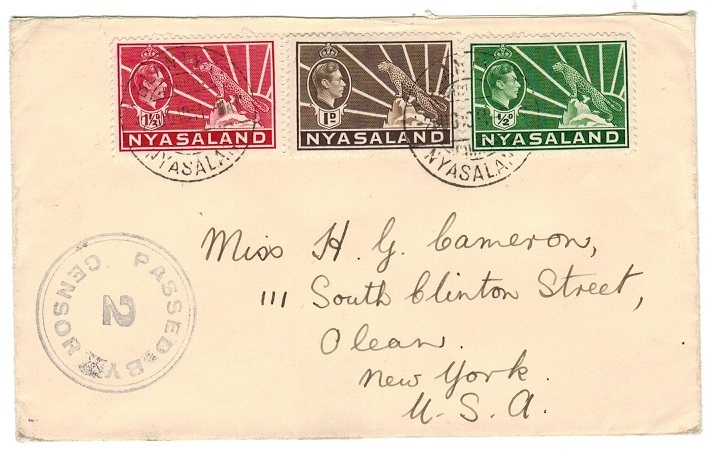 NYASALAND - 1946 'Victory' pair on cover to USA used at MALAMULO. 1946 (DEC.16.) cover addressed to USA bearing the Victory adhesive pair each tied by neat scarcer MALAMULO/NYASALAND cds's. Proud type D2. NYASALAND - 1942 3d rate censored cover to USA used at ZOMBA. 1942 (JA.25.) 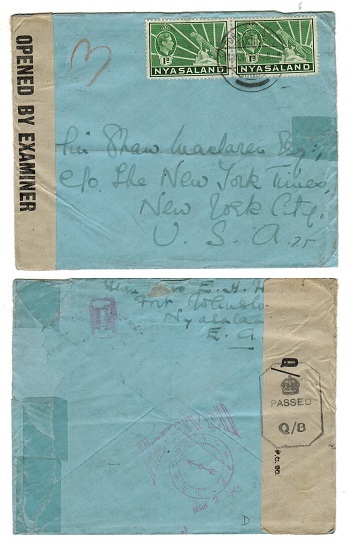 cover addressed to USA from the 'Nyasaland Turf Club' bearing 1d and 2d adhesives tied by ZOMBA/DRINK- slogan h/s with black on white OPENED BY CENSOR label at left (Little IIA) tied on the front by violet circular PASSED BY CENSOR 15 h/s (Little type 1). 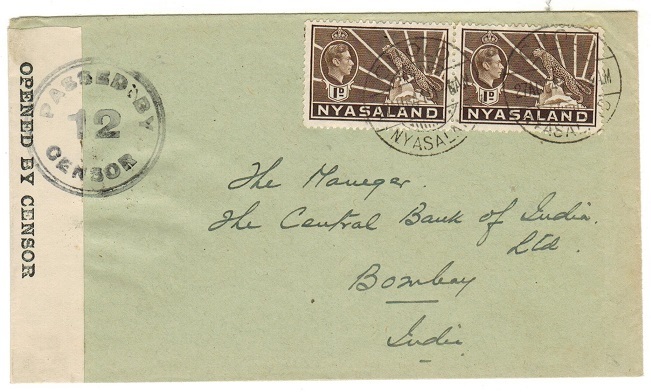 NYASALAND - 1941 2d rate censored cover to India used at CHOLO with rare '12' h/s. 1941 (AUG.27.) cover addressed to India (scarce) bearing 1d (x2) tied by CHOLO/NYASALAND cds with black on cream OPENED BY CENSOR (Little type IIa) censor label at left tied on the front by black circular PASSED BY/12/CENSOR h/s on front. Number 12 is scarce. NYASALAND - 1941 2d rate censored cover to USA used at KARONGA. 1941 (14.4.) 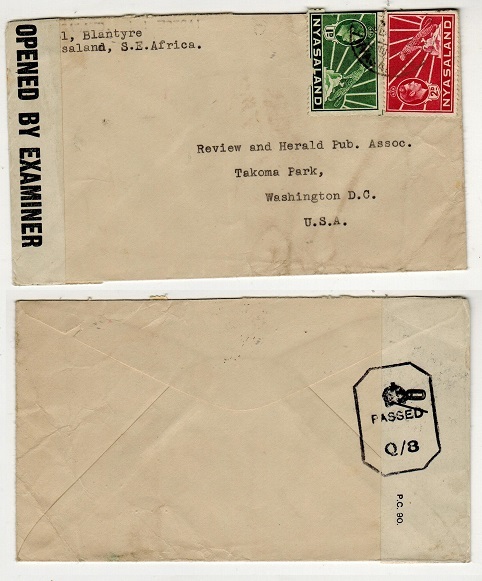 cover addressed to USA bearing 2d adhesive tied by KARONGA cds (Proud D7) with circular PASSED BY/CENSOR/10 h/s in black (CC I) with P.C.90/OPENED BY/EXAMINER 4417 label applied on route. NYASALAND - 1941 2d rate censor cover to Canada with unrecorded '6' h/s. 1941 (MY.31.) 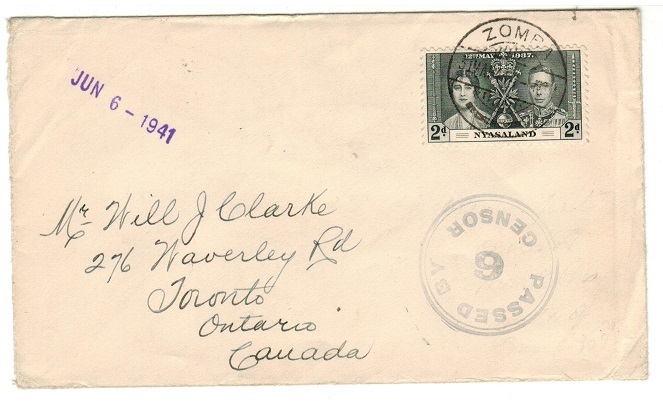 cover addressed to Canada bearing the 2d 'Coronation' adhesive tied ZOMBA with black circular PASSED BY/6/CENSOR h/s below (Little type 1). Noted as being rare with Number 6 not being noted by Little. NYASALAND - 1940 3d rate 'OPENED BY CENSOR ' cover to USA. 1940 (JU.8.) 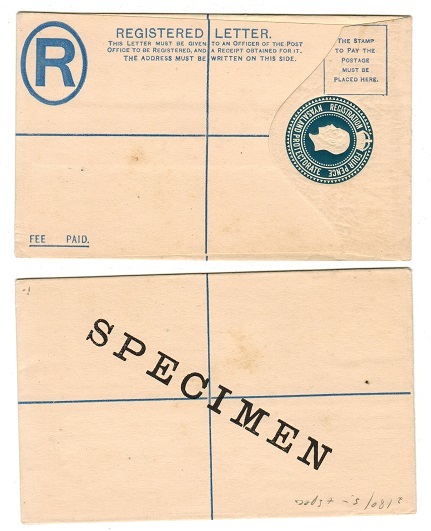 cover addressed to USA bearing 3d adhesive tied by SMOKE IMPERIAL cancel with black on cream OPENED BY CENSOR label at left with '2' inserted in manuscript. Little type II a. 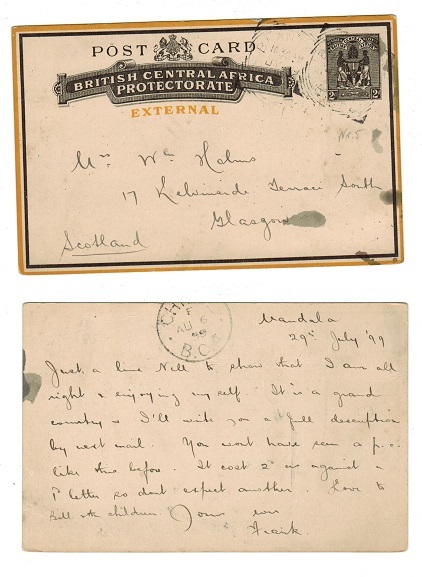 1895 2d black and white 'external' postal stationery postcard addressed to Germany cancelled squared circle FORT JOHNSTON/BCA cancel dated MY.11.08. H&G 5. 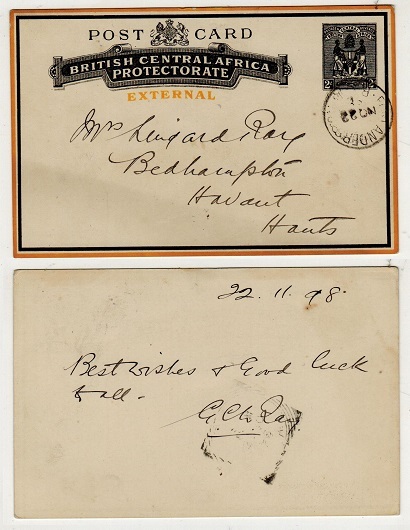 NYASALAND - 1895 2d black and yellow PSC to UK used at FORT ANDERSON. H&G 5. 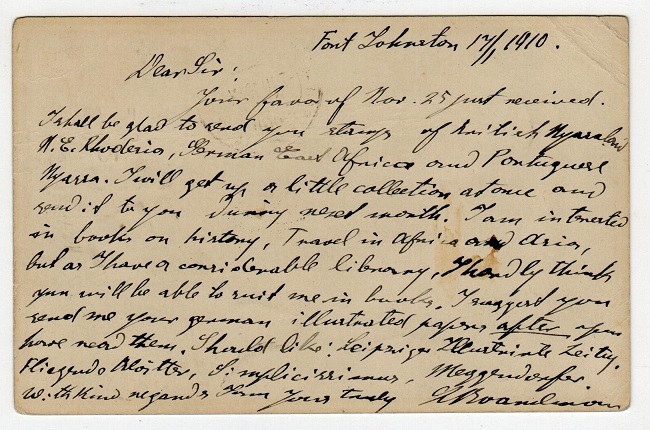 1895 2d black on cream (yellow border) 'External' postal stationery postcard addressed to UK cancelled by FORT ANDERSON/B.C.A. cds (Proud type D3) dated NO.22.98. H&G 5. NYASALAND - 1942 (circa) 3d rate 'PASSED BY CENSOR/2' cover to USA used at MKHOMA. 1942 circa cover to USA bearing 3d adhesive tied by light MKHOMA cds (Proud type D3) with black on white OPENED BY CENSOR label at left & struck by circular PASSED BY/2/CENSOR h/s on front. 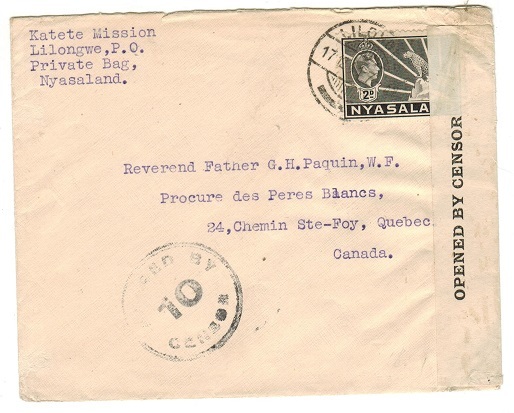 NYASALAND - 1941 2d rate 'PASSED BY CENSOR 10' cover to Canada from the Katete Mission. 1941 (17.12.) 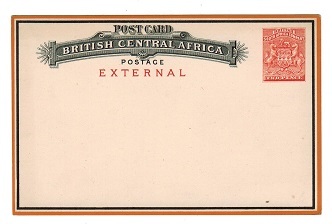 cover addressed to Canada bearing 2d adhesive tied LILONGWE with black on white OPENED BY CENSOR label at right (Little type IIa) with circular PASSED BY/10/CENSOR strike on front. Sent from the Katete Mission. (Little type I). 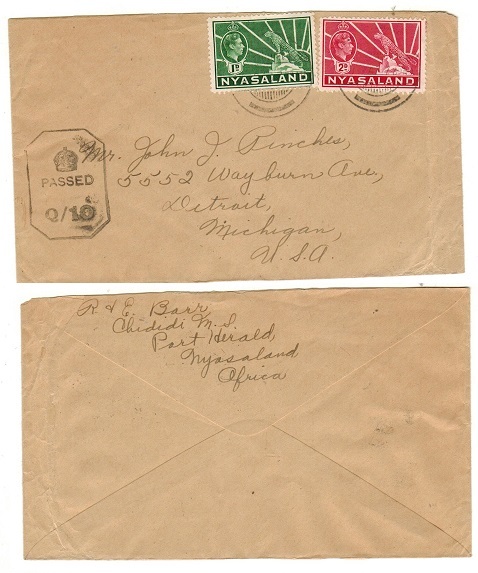 NYASALAND -1945 2d rate 'PASSED/ Q/8' censor cover to USA (faults) used at FORT JOHNSTON. 1945 (JAN.14.) 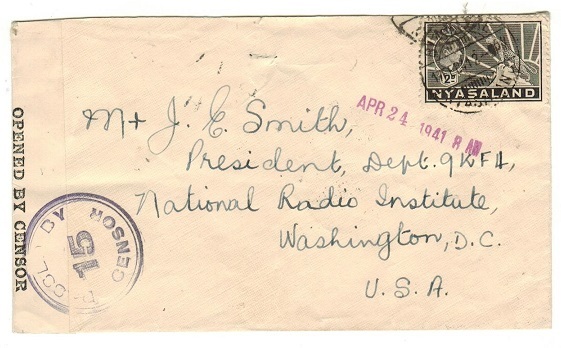 cover to USA (minor faults and sellotape marks) bearing 1d adhesive pair tied FORT JOHNSTON with black on white OPENED BY EXAMINER/ Q/ P.C.90 censor label at left (Little type IIIb) and tied on reverse side by black crowned octagonal PASSED / Q/8 censor. Little type II. NYASALAND - 1943 3d rate 'PASSED/ Q/10' censor cover to USA. 1943 cover addressed to USA bearing 1d and 2d adhesives tied by weak PORT HERALD cds with black crown octagonal PASSED / Q/10 censor h/s on front. Little type II. NYASALAND - 1898 1d imperforate 'cheque' stamp local cover used at BLANTYRE. 1898 (AP.18.) 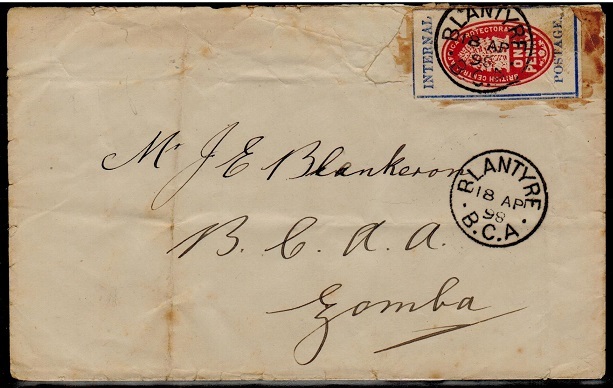 cover addressed locally to Zomba (vertical fold at left and faults around the adhesive having been heavily glued) bearing the 1d imperforate 'cheque' stamp (SG 55b) cancelled by s/r BLANTYRE/B.C.A. cancel with a further strike below. ZOMBA arrival b/s. 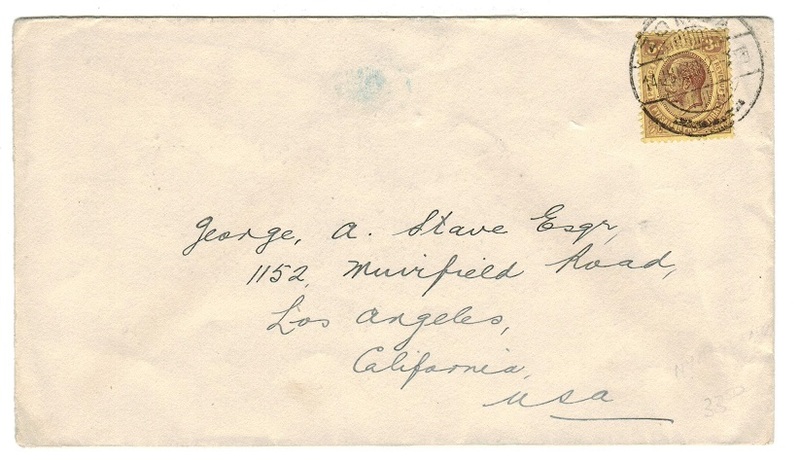 Faults but scarce as most commercial covers are postmarked after June. NYASALAND - 1936 Magistrates ledger page with 3/- adhesives indicating payment made in cash. 1936 (8.MAY.) 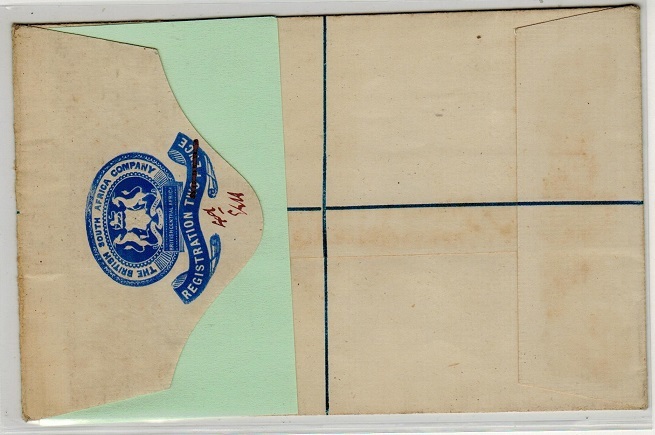 Magistrates ledger page for a fine of 3/- or a months prison for being in possession of illegal liquor paid for in cash and with 1/- adhesives added with 2/- 'key plate' tied by oval rubber offical handstamp. NYASALAND - 1937 Magistrates ledger page with 3/- adhesive indicating payment made in cash. 1937 (26.AUG.) Magistrates ledger page for a fine of 3/- or 7 days in prison for riding a bicycle without brakes paid in cash with 3d pair and 2/6d 'key plate' adhesives added tied by double ringed oval TOWN MAGISTRATES/BLANTYRE cancels. NYASALAND - 1928 Magistrates Ledger sheet with 4/6d and 2/- adhesives indicating payment by cash. 1928 (2.2) double sided Magistrates criminal ledger sheet made out for 'causing a nuisance'. One side with fine of 4/6d (bail 2/- and nuisance 2/6d) paid in cash and with 1/- adhesive pair added and 2/6d 'key plate' to show payment tied by oval cog-wheeled THE ASST.MAGISTRATE/LIMBE handstamp in violet. The other side fine 2/- or 7 days in prison paid again in cash with 1/- adhesive pair added and similarly cancelled. 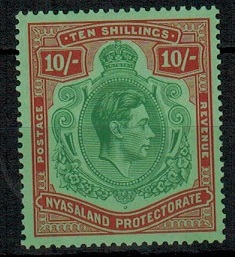 NYASALAND - 1893 1/- on £1 blue and red overprinted REVENUE/B.C.A. in fine mint condition. 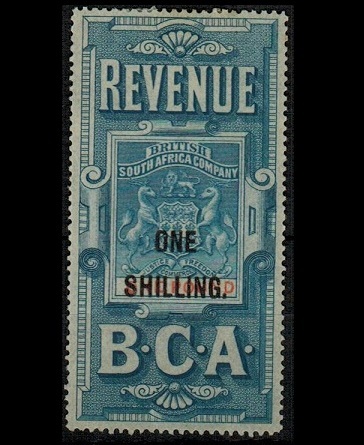 1893 1/- on £1 blue and red overprinted REVENUE/B.C.A. in fine mint condition. Barefoot and Hall No.13. NYASALAND - 1892 2d ultramarine RPSE unused. H&G 1a. 1892 2d ultramarine on cream registered postal stationery envelope (size H2) in fine unused condition with the 'R' in oval 28mm high. H&G 1a. NYASALAND - 1937 'Coronation' FDC to Natal used at NAMWERA. 1937 (MAY.12.) 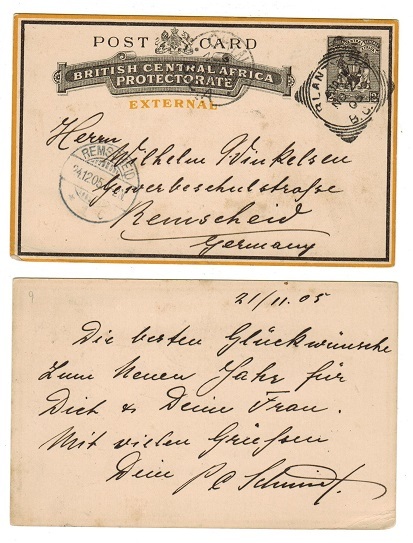 first day cover addressed to Natal in South Africa bearing the 'Coronation' trio (SG 127-29) tied by NAMWERA cds's. Proud type D2. Some tone staining around the perforation edges due to gum but a scarcer cancel from this sub office under Fort Johnston. 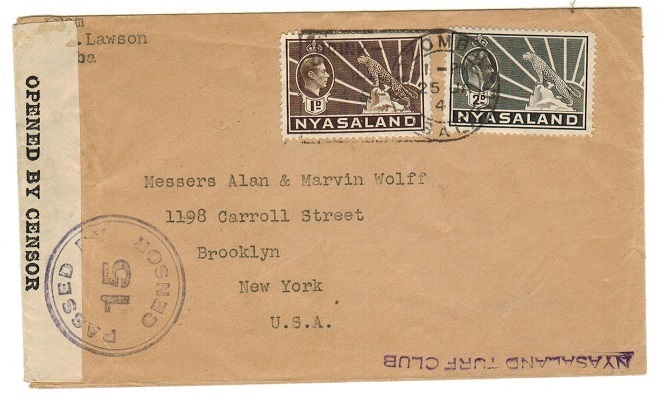 NYASALAND - 1943 (circa) 'Q8' 3d rate censor cover to USA. 1943 (circa) cover addressed to USA bearing 1d and 2d adhesives tied by part BLANTYRE/NYASALAND cds with black on white OPENED BY EXAMINER/ Q/ P.C.90 label at left side tied on the reverse side by black crowned octagonal crowned PASSED/ Q/8 h/s. Little type II. NYASALAND - 1934 2d rate cover used by T.P.O./NYASALAND. 1934 (SEP.21.) cover addressed locally to Blantyre bearing 2d adhesive tied by T.P.O./NYASALAND cds. 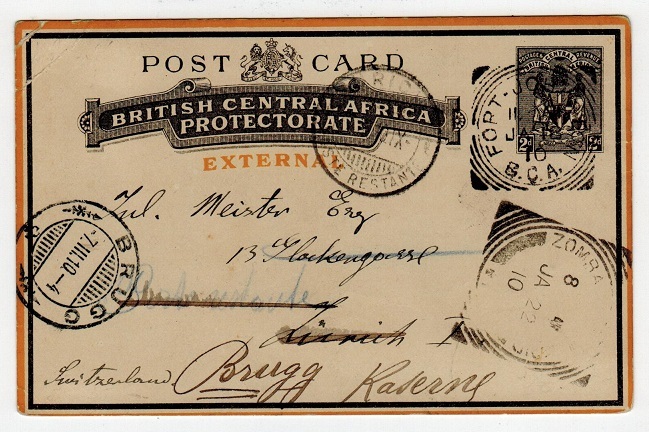 Sent from the 'Cleveland Bridge and Engineering Co' at Mutarara in Portugese East Africa. Taken by the 'Shire Highland Railway Company'. 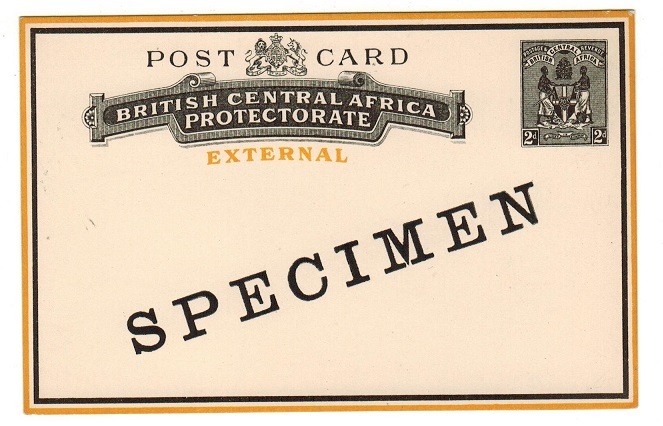 NYASALAND - 1895 1d black 'Internal' PSC unused. H&G 4. 1895 1d Black on white 'Internal' postal stationery postcard. Fine unused. H&G 4. NYASALAND - 1942 3d rate censored cover to USA. 1942 cover addressed to USA bearing 3d adhesive tied by ZOMBA cds with black on cream OPENED BY CENSOR label at left tied on the front by circular PASSED BY/2/CENSOR strike. Little type1. 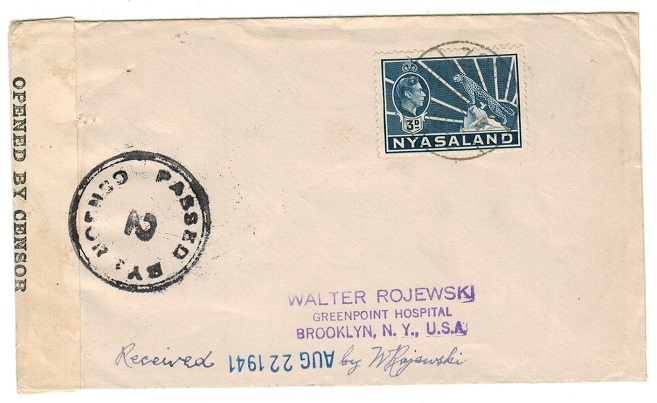 NYASALAND - 1943 PASSED/Q8 censor cover to Canada used at MZIMBA. 1943 (27.9.) cover addressed to Canada (a little crumpling) bearing 2d adhesive tied by scarcer MZIMBA/NYASALAND cds with black on cream OPENED BY EXAMINER/ Q / -372-P.C.90 censor label at left (Little type VD) tied on the reverse by black octagonal crowned PASSED/ Q/8 censor h/s. 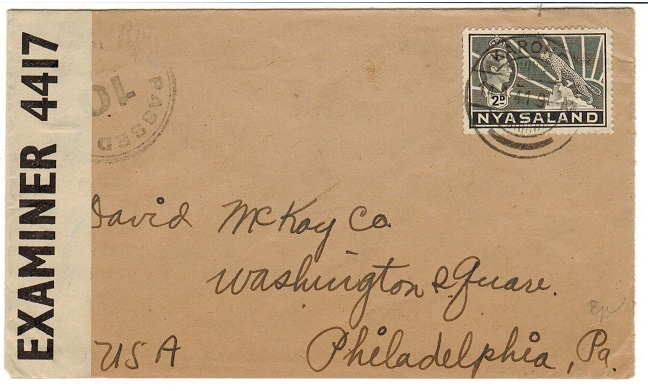 NYASALAND - 1943 PASSED/Q6 censor cover to USA used at BLANTYRE. 1943 (SEP.14.) commercial cover addressed to USA bearing 1 1/2d black adhesive pair tied by two part strikes of the BLANTYRE/NYASALAND cds's with black crowned octagonal PASSED / Q/6 censor h/s. 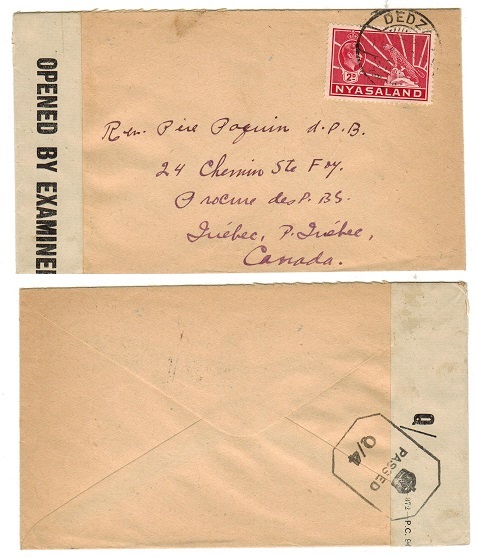 NYASALAND - 1943 PASSED/Q4 censor cover to Canada used at DEDZA. 1943 (1.9.) 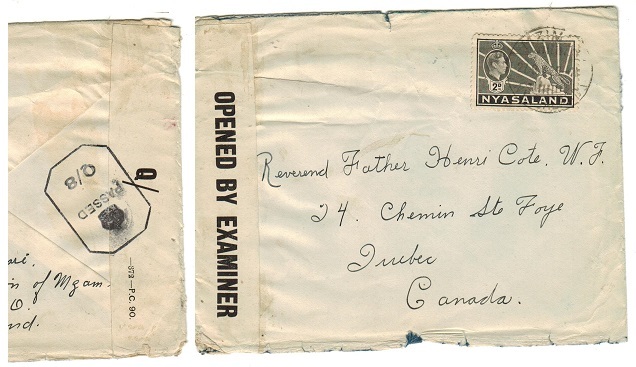 cover addressed to Canada bearing 2d adhesive tied by DEDZA/NYASALAND cds and with rare black on white OPENED BY CENSOR/ Q/ -372-P.C.90 censor label at left (CCSG type VD) tied on reverse by octagonal crowned PASSED/ Q/4 censor h/s. 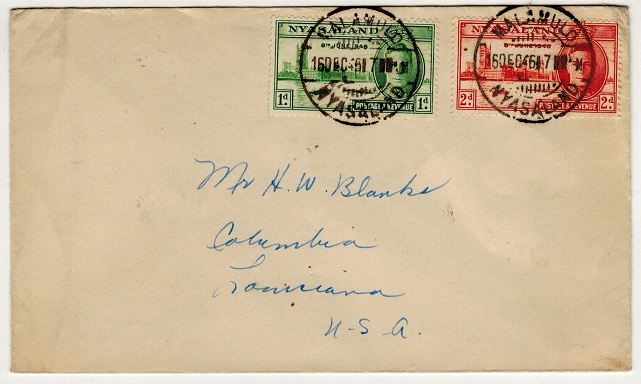 NYASALAND - 1941 PASSED/2/CENSOR cover to USA used at BLANTYRE. 1941 (AUG.2.) 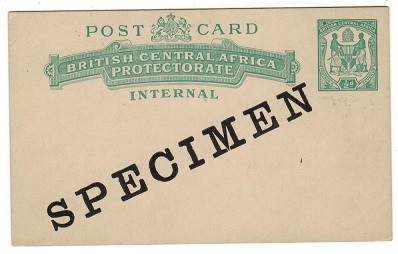 cover addressed to USA bearing 1/2d, 1d and 1 1/2d adhesives tied by BLANTYRE/ NYASALAND cds with circular PASSED/2/CENSOR handstamp applied below in black. (Little type 1). 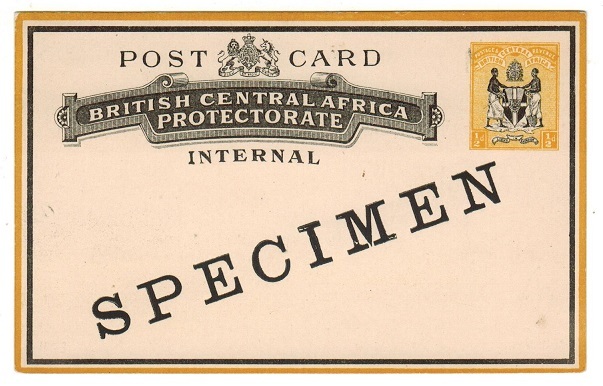 NYASALAND - 1895 1/2d black and yellow on cream 'Internal' PSC SPECIMEN. 1895 1/2d black and yellow on cream 'Internal' postal stationery postcard in fine unused condition overprinted SPECIMEN diagonally. H&G 3. 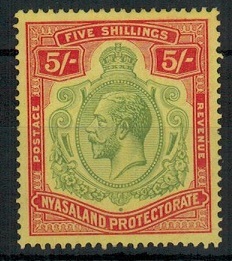 NYASALAND - 1895 2d black and yellow on cream 'External' PSC SPECIMEN. 1895 2d Black on white 'External' postal stationery postcard in fine unused condition with diagonal SPECIMEN h/s. H&G 5. 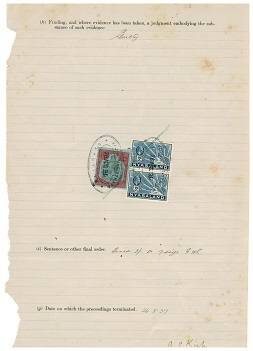 NYASALAND - 1908 1/2d green PSC SPECIMEN. H&G 1. 1908 1/2d green on cream postal stationery postcard in fine unused condition overprinted SPECIMEN diagonally. H&G 1. NYASALAND - 1903 1d carmine PSC SPECIMEN. H&G 2. 1903 1d carmine on buff postal stationery postcard in fine unused condition overprinted SPECIMEN diagonally in black. H&G 2. NYASALAND - 1933 1 1/2d rate postcard to Italy used at KARONGA. 1933 (31.7.) 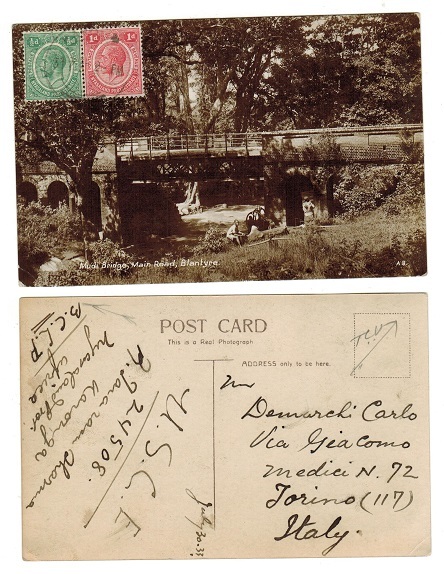 use of picture postcard addressed to Italy depicting 'Mudi Bridge, Main Road, Blantyre' bearing 1/2d and 1d adhesives tied to picture side by KARONGA cds. 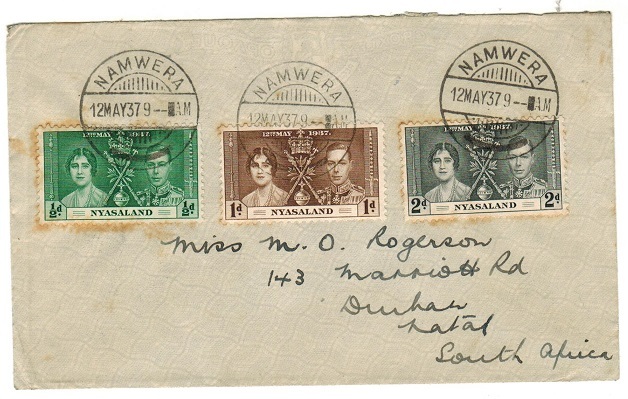 NYASALAND - 1938 'KGVI' series on three registered covers to South Africa. 1938 (FEB.12.) 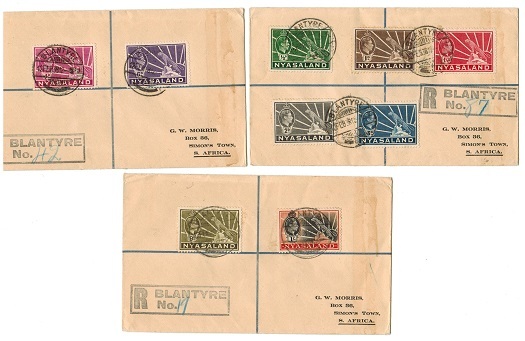 range of three registered covers addressed to South Africa bearing the 'Symbol Of The Protectorate' original series to the 1/- (SG 130-138 / 9 values) each cancelled by BLANTYRE cds's and with black rubber boxed R/BLANTYRE/No h/s's. (3 covers). 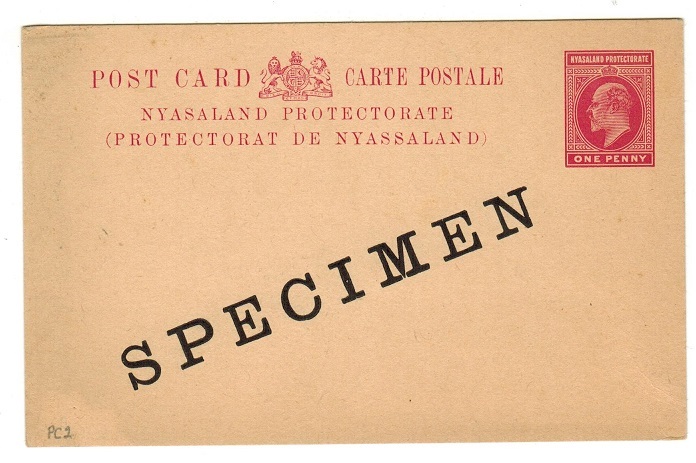 NYASALAND - 1916 1d carmine PSE unused SPECIMEN. H&G 2. 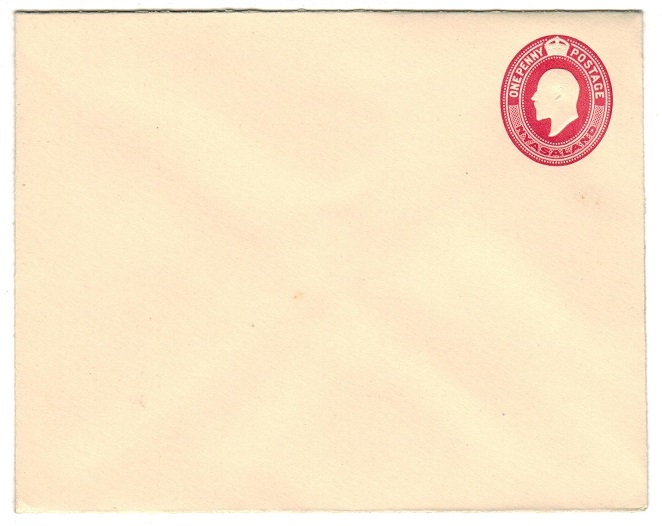 1916 1d carmine postal stationery envelope (small pin hole in reverse flap) in unused condition and with black diagonal SPECIMEN on front. H&G 2. NYASALAND - 1914 4d RPSE (size F) unused with SPECIMEN. H&G 2. 1914 4d blue on cream registered postal stationery envelope (size F) in unused condition with black diagonal SPECIMEN on reverse. H&G 2. 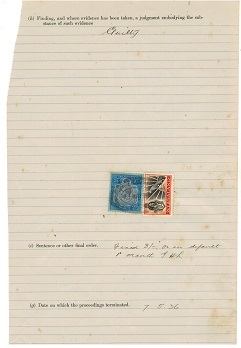 NYASALAND - 1899 1d carmine postal stationery wrapper SPECIMEN. H&G 1. 1899 1d carmine on buff postal stationery wrapper (central horizontal fold) overprinted diagonally SPECIMEN in black. H&G 1. NYASALAND - 1936 1d rate cover to Transvaal used at CHIRADZULU. 1936 (5.11.) 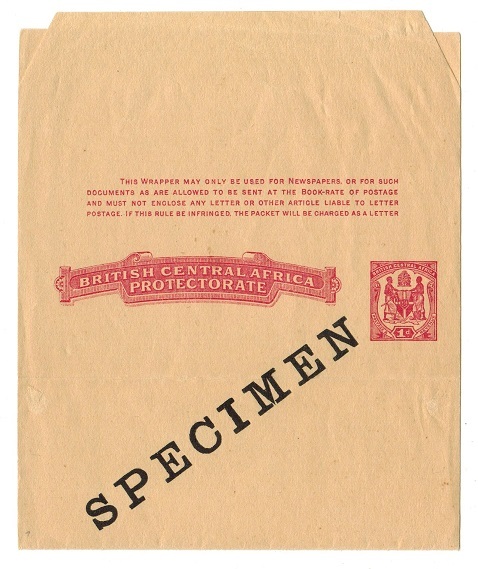 cover addressed to Transvaal (central fold) bearing 'leopard' 1d brown adhesive tied by CHIRADZULU cds (Proud type D3). 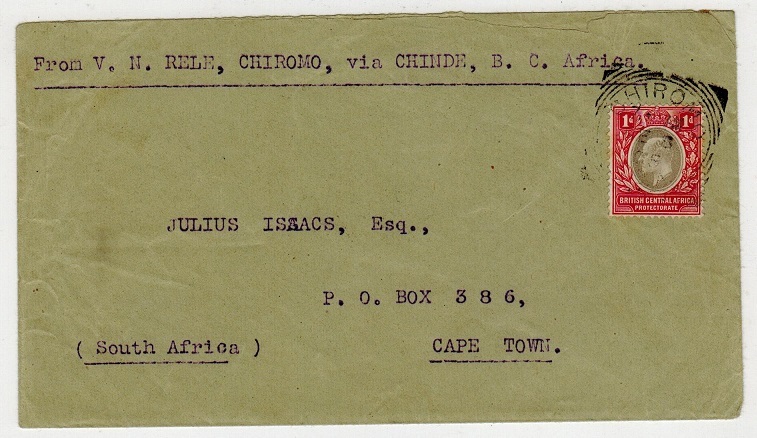 NYASALAND - 1905 1d rate cover to Cape Town used at CHIROMO. 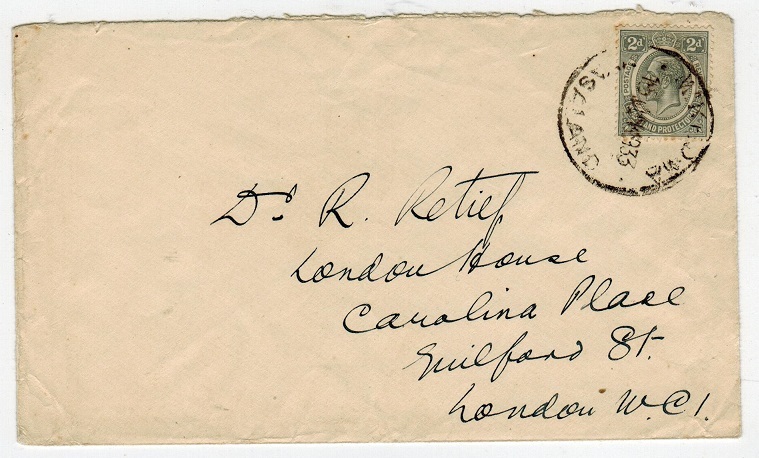 1905 (DE.8) cover to Cape Town bearing 1d (SG 59) tied by squared circle CHIROMO/BCA cancel with s/r CHINDE/BCA transit b/s & Cape Town arrival cds. 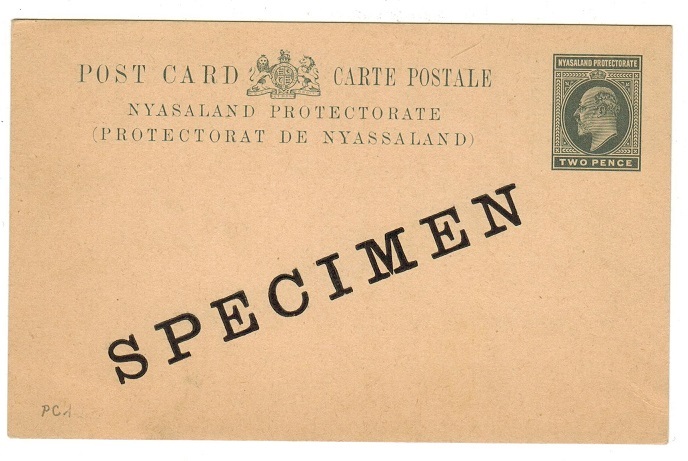 NYASALAND - 1912 1d carmine PSE unused. H&G 1. 1912 1d carmine on thick cream postal stationery envelope in fine unused condition. Elusive item. H&G 1. 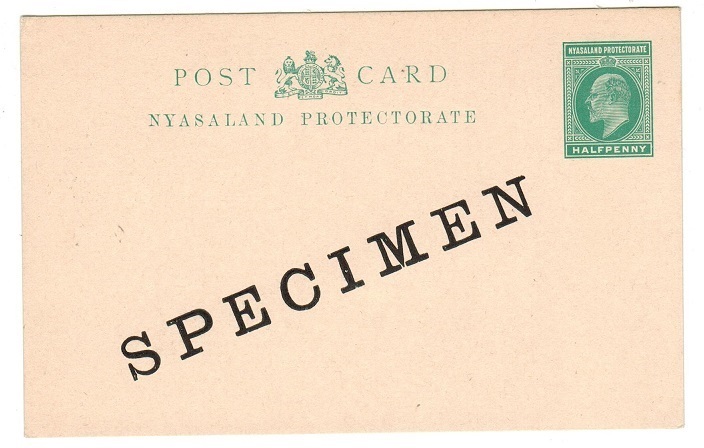 NYASALAND - 1904 1/2d green PSC unused. H&G 8. 1904 1/2d Green on cream postal stationery postcard. Fine unused. H&G 8. 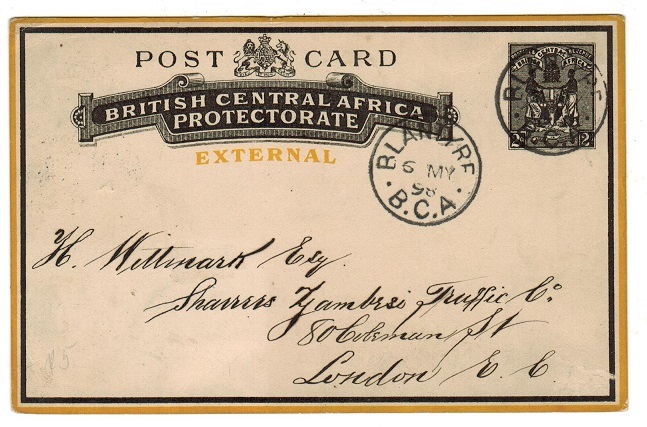 NYASALAND - 1895 2d 'external' PSC to Germany used at TSHIROMO. H&G 5. 1895 2d black and white 'external' postal stationery postcard addressed to Germany cancelled blotched s/r TSHIROMO/B.C.A. cds dated 29.8.99 (Proud type D4) with HAMBURG arrival dated 18.10.99. The card has a diagonal crease but is a scarce striking. H&G 5. 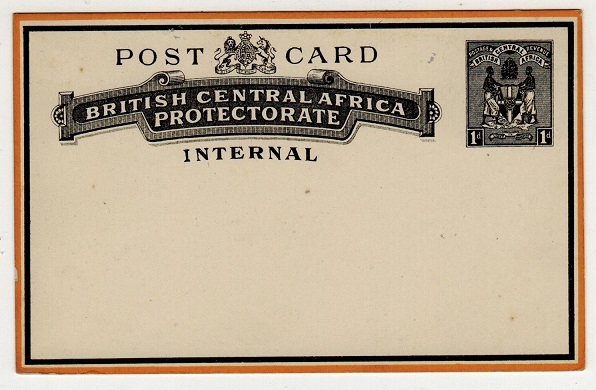 NYASALAND - 1895 2d 'external' PSC to UK used at BLANTYRE. H&G 5. 1895 2d black and white 'external' postal stationery postcard addressed to UK cancelled squared circle BLANTYRE/BCA cancel dated JY.9.99. H&G 5. 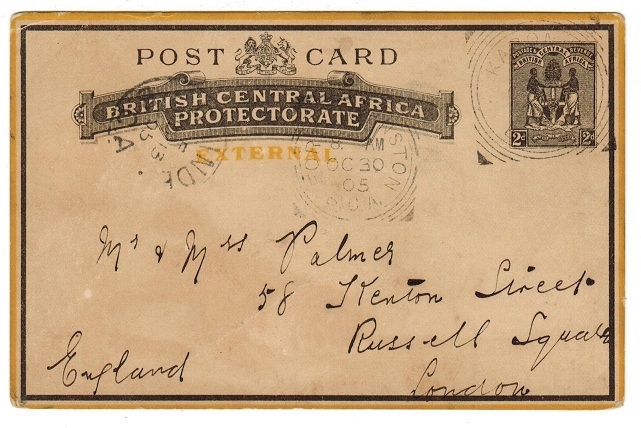 NYASALAND - 1895 2d 'external' PSC to Germany used at BLANTYRE. H&G 5. 1895 2d black and white 'external' postal stationery postcard addressed to Germany cancelled squared circle BLANTYRE/BCA cancel dated NO.21.05. H&G 5. 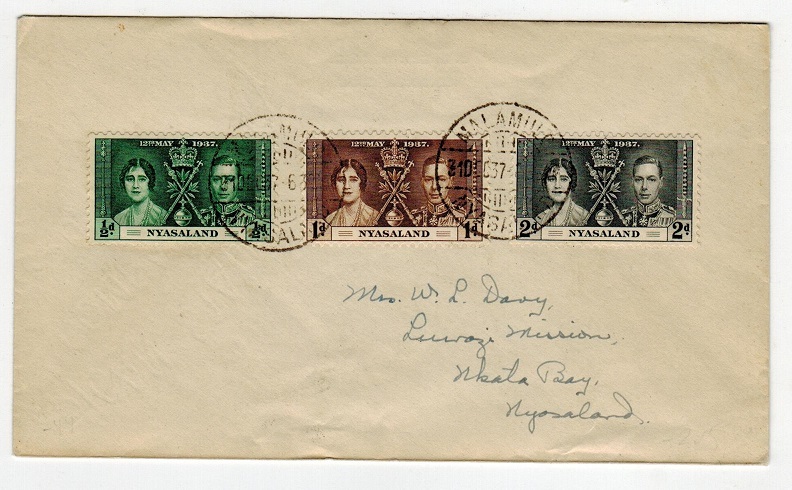 NYASALAND - 1908 2d grey PSC unused with diagonal SPECIMEN h/s. H&G 3. 1903 2d grey on buff postal stationery postcard in fine unused condition overprinted SPECIMEN diagonally in black. H&G 3. 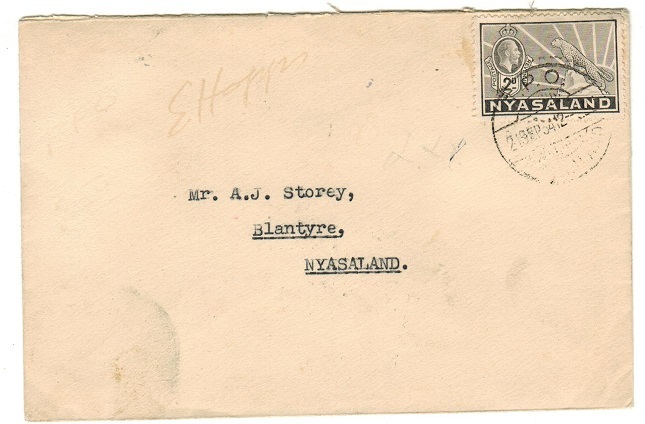 NYASALAND - 1908 2d grey PSC unused. H&G 3. 1908 2d Grey on buff postal stationery postcard. Fine unused. H&G 3. 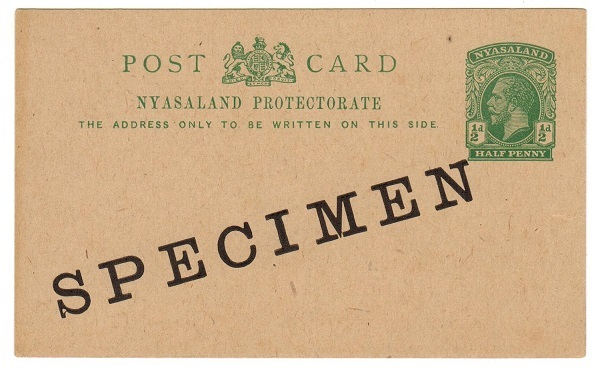 NYASALAND - 1908 1/2d green PSC unused. H&G 1. 1908 1/2 Green on cream postal stationery postcard. Fine unused. H&G 1. 1895 2d black on white 'External' postal stationery postcard addressed to UK (short message) cancelled by BLANTYRE/BCA s/r cds dated 6.MY.98. H&G 5. NYASALAND - 1895 2d PSC to UK used at KARONGA. H&G 5. 1895 2d black on white 'External' postal stationery postcard addressed to UK (overall toned) cancelled by scarce squared circled KARONGA cds dated OC.21.05 with squared circle FORT JOHNSTON/BCA and s/r CHINDE transit cds's alongside. H&G 5. NYASALAND - 1909 1d rate cover to UK used at FORT JOHNSTON. 1909 (SP.23.) 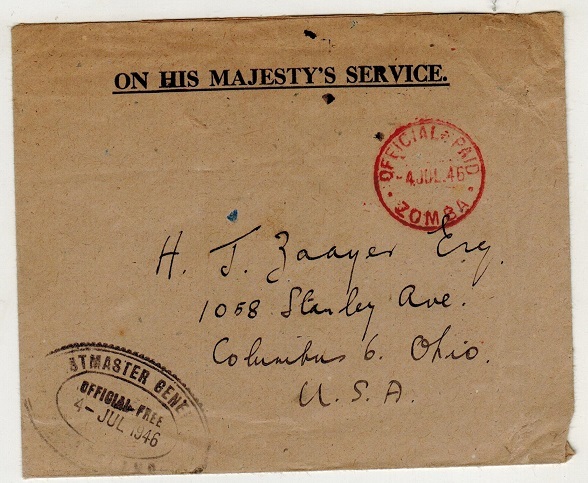 cover addressed to UK bearing 1d adhesive tied by squared circle FORT JOHNSTON/ B.C.A. cancel (Proud type D4) and complete with original letter. Squared circle CHINDE B.P.O. b/s. NYASALAND - 1929 5/- green and red on yellow mint. SG 112. 1929 5/- green and red on yellow in fine mint condition. SG 112. NYASALAND - 1938 2/- purple and blue on blue mint. SG 139. 1938 2/- purple and blue on blue in fine lightly mounted mint condition. SG 139. NYASALAND - 1938 2/6d black and red on blue mint. SG 140. 1938 2/6d black and red on blue in fine lightly mounted mint condition. SG 140. 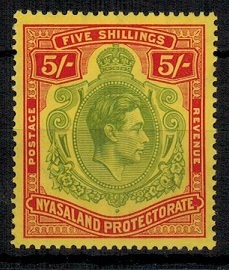 NYASALAND - 1938 5/- pale green and red on yellow mint. SG 141. 1938 5/- pale green and red on yellow in fine lightly mounted mint condition. SG 141. NYASALAND - 1938 10/- emerald and deep red on pale green mint. SG 142. 1938 10/- emerald and deep red on pale green in fine lightly mounted mint condition. SG 142. 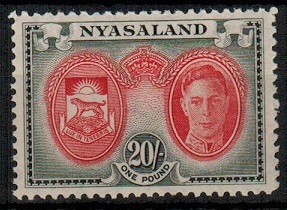 NYASALAND - 1945 20/- scarlet and black fine mint. SG 157. 1945 20/- scarlet and black in fine mint condition. SG 157. 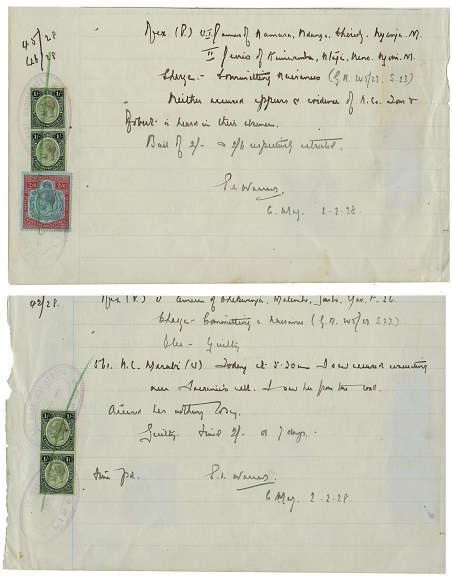 NYASALAND - 1904 1d rate cover to Ireland used at CHIROMO. 1904 (JA.11.) 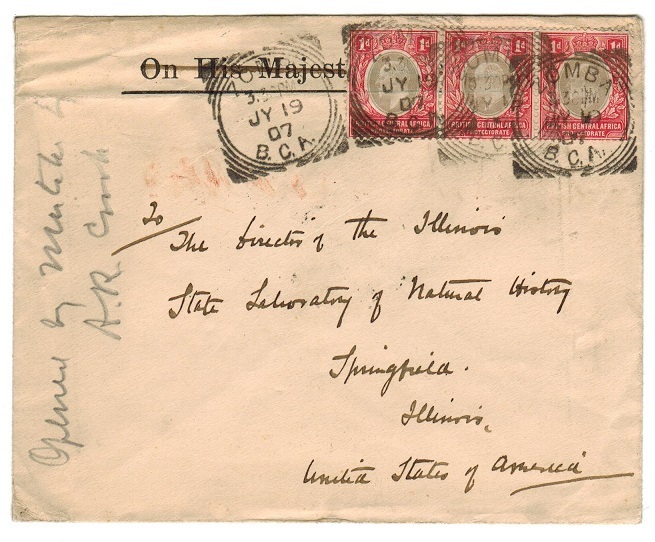 cover addressed to Ireland bearing British Central African 1d adhesive tied by squared circle CHIROMO/B.C.A. cds. Light central fold. CHINDE b/s and BELFAST arrival. NYASALAND - 1940 censored cover to USA. 1940 (NO.26.) 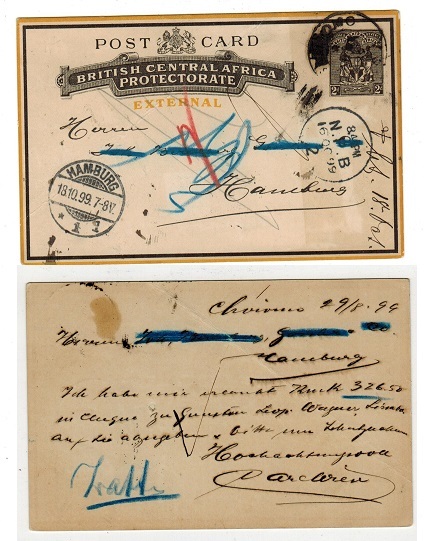 cover addressed to USA (small piece of lower right corner missing) bearing 3d adhesive tied by BLANTYRE/NASALAND cds with black on white OPENED BY CENSOR label at right tied on the front by circular PASSED BY CENSOR/10 h/s. (Little type I). 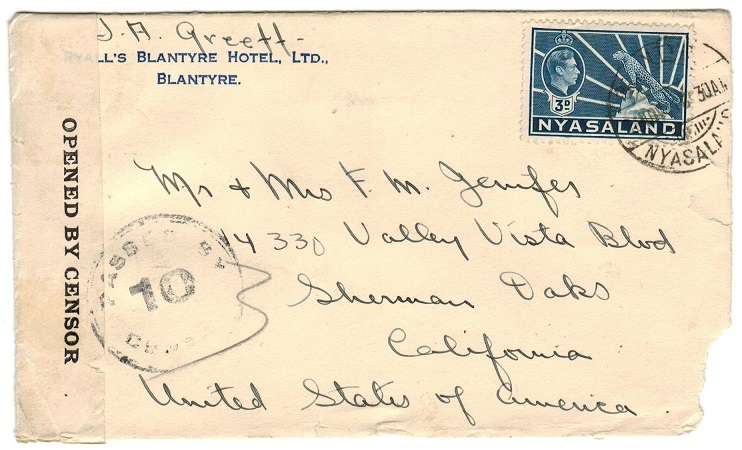 NYASALAND - 1907 OHMS envelope reused to USA with 1d strip tied by BLANTYRE cancels. 1907 (JY.19.) 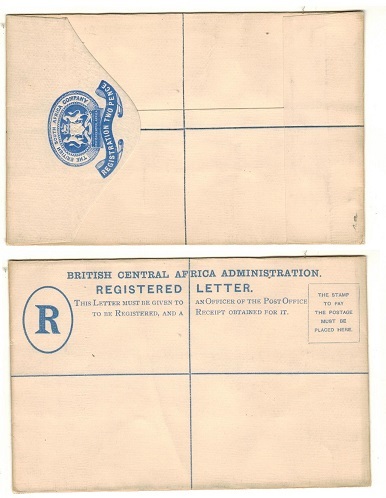 re-use of small sized OHMS envelope addressed to USA bearing a fine strip of three of the British Central Africa 1d adhesive (very light horizontal fold) tied by squared circle ZOMBA/ BCA cancels. CHINDE transit b/s. 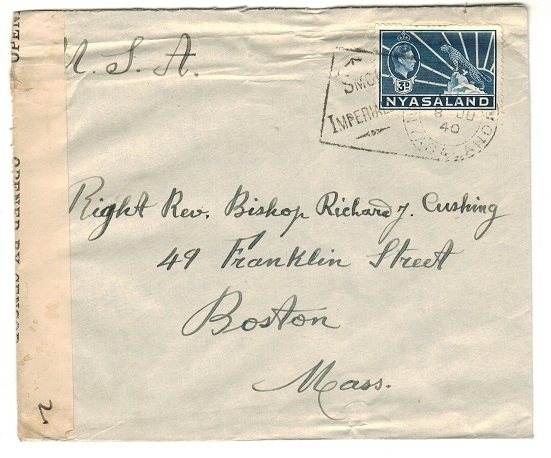 NYASALAND - 1916 3d rate cover to USA used at ZOMBA. 1916 (JU.14.) cover addressed to USA bearing 3d adhesive tied by ZOMBA cds. NYASALAND - 1937 'Coronation' cover to Nakala bay used at MALAMULO. 1937 (DEC.31.) cover addressed locally to Nakala Bay bearing the 'Coronation' trio tied by MALAMULO/NYASALAND cds's. (Proud type D2). Not an easy cancel to find. 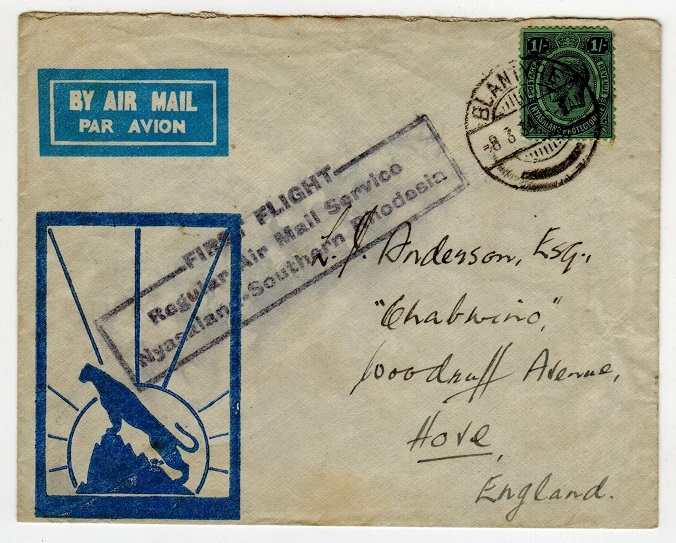 NYASALAND - 1934 first flight cover to UK. 1934 (8.3.) 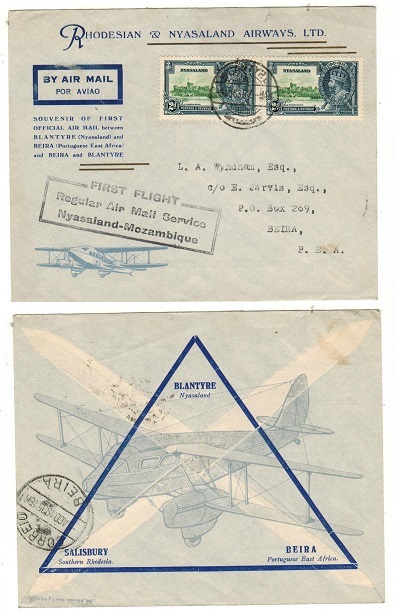 illustrated first flight cover addressed to UK bearing 1/- adhesive tied by BLANTYRE cds with black boxed FIRST FLIGHT/REGULAR AIR MAIL SERVICE/NYASALAND-SOUTHERN RHODESIA h/s at left. NYASALAND - 1920 (circa) four view unused postcard of Central Africa. 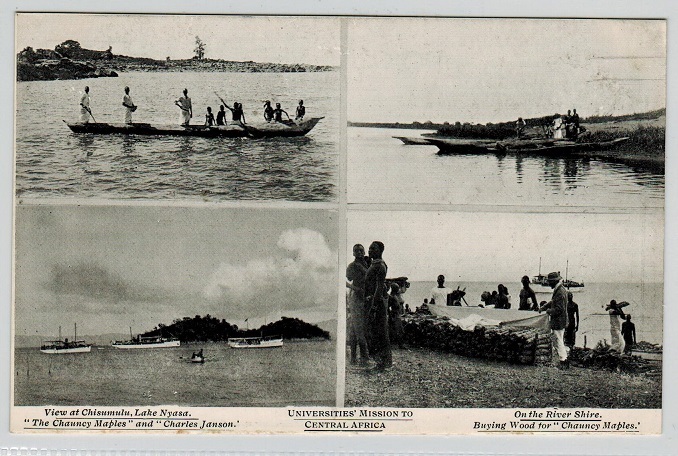 1920 (circa) unused picture postcard produced by the 'Universities Mission to Central Africa' showing four pictures of 'View of Chisumulu/On the River Shire/The Chauncy Maples and buying wood for Chauncy Maples'. Some light tone spots on reverse side. 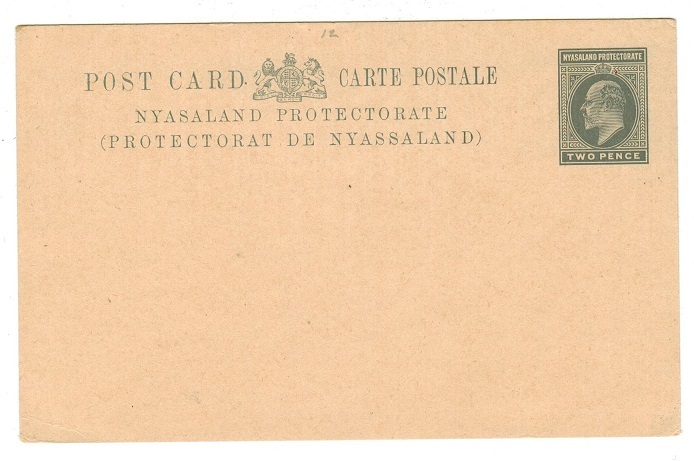 NYASALAND - 1895 2d PSC to Switzerland used at FORT JOHNSTON. H&G 5. 1895 2d Black on white 'External' postal stationery postcard addressed to Switzerland & cancelled by squared circle FORT JOHNSTON cds dated JA.18.10 with squared circle ZOMBA/NYASALAND cds transit. H&G 5. NYASALAND - 1935 (circa) cover to Bulawayo used on T.P.O.SOUTH/NYASALAND railway. 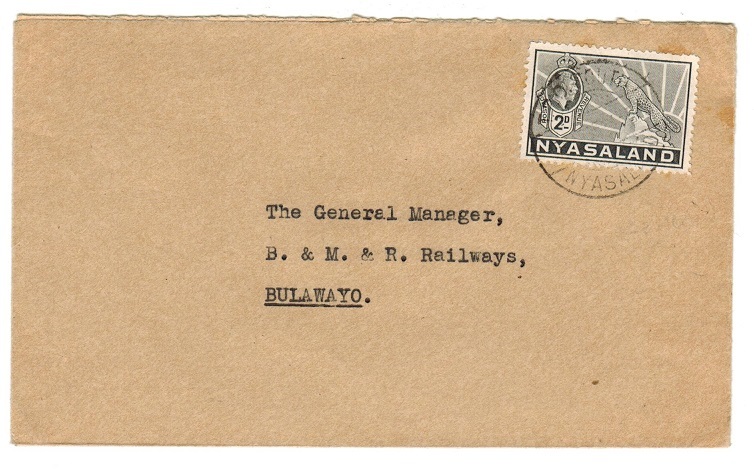 1935 (circa) cover addressed to the General Manager of the B & M & R Railways at Bulawayo bearing 2d grey 'leopard' adhesive tied by light T.P.O.SOUTH/NYASALAND cds. (Proud type D7). NYASALAND - 1917 TELEGRAPH form dated at ZOMBA/A.T./TEL office. 1917 (SP.6.) 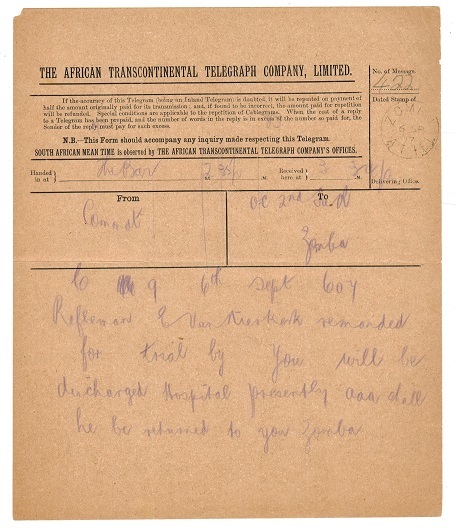 use of black on salmon-buff coloured THE AFRICAN TRANSCONTINENTAL TELEGRAPH COMPANY LIMITED telegram form to Zomba with neat s/r ZOMBA/A.T. TEL telegraphs datestamp applied. Refers to rifleman 'E Van Nierkerk' being remanded for trail having been discharged from hospital. NYASALAND - 1932 cover to Kenya with 1d pair tied T.P.O./NYASALAND. 1932 (AUG.18.) 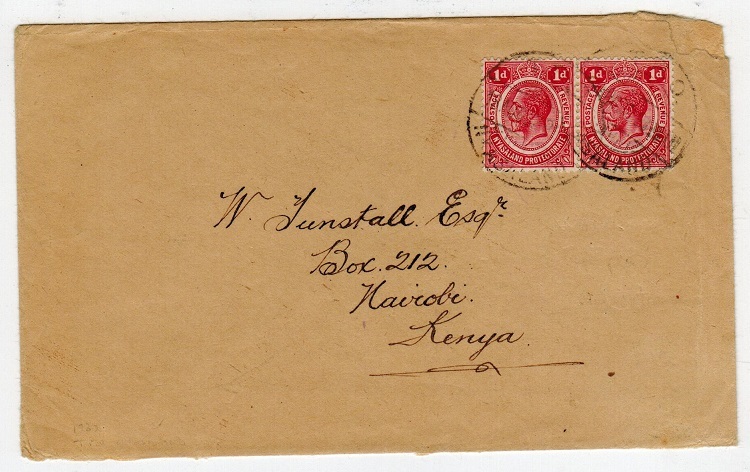 cover addressed to Kenya bearing 1d pair tied by light T.P.O.NYASALAND cds. Nairobi arrival b/s. 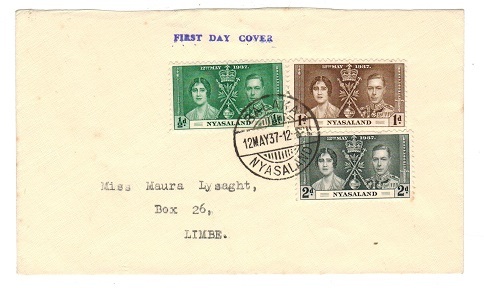 NYASALAND - 1933 cover to UK used at MKHOMA. 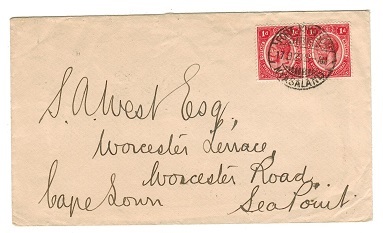 1933 (JUN.15) cover to UK bearing 2d (SG103) tied by s/r MKHOMA/NYASALAND temporary cds. Nodder type 37a. Scarce. NYASALAND - 1937 'Coronation' trio used to Limbe from BALAKA. 1937 (MAY.12.) 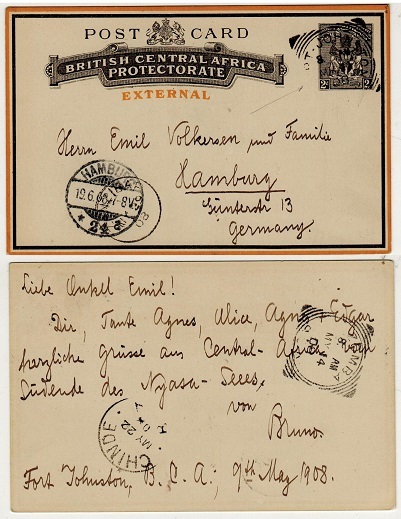 first day cover (ex reverse flap) addressed to Limbe bearing the 'Coronation' trio tied by d/r BALAKA/NYASALAND cds (Proud type D2). NYASALAND - 1934 cover to Kenya from CHIKWAWA. 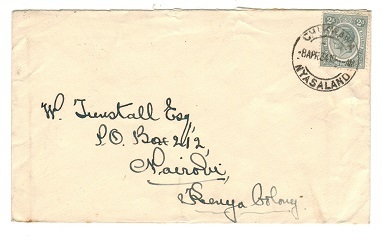 1934 (APR.8) cover to Kenya bearing 2d (SG103) tied CHIKAWA/NYASALAND cds. 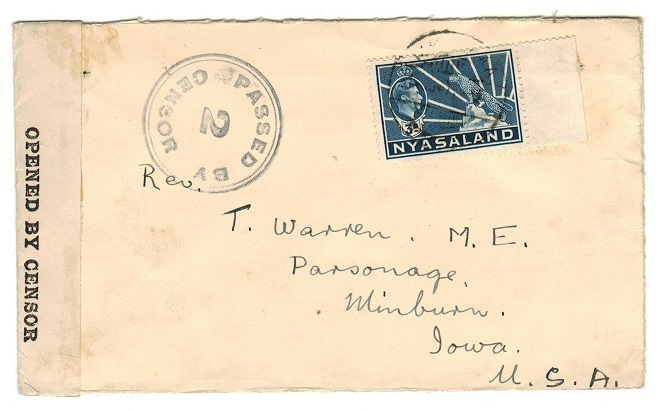 NYASALAND - 1934 cover to Nkana from FORT MANNING. 1934 (25.6) cover to Nkana in N. Rhodesia bearing 2d (SG117) tied by FORT MANNING cds. 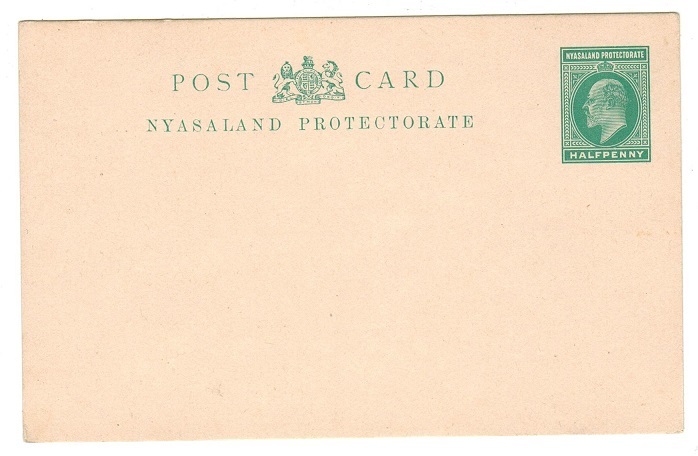 NYASALAND - 1895 2d 'External' PSC unused. H&G 5. 1895 2d black on white 'External' postal stationery postcard. Fine unused. H&G 5. 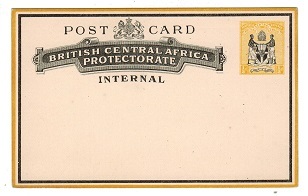 NYASALAND - 1895 1/2d 'Internal' PSC unused. H&G 3. 1895 1/2d Black & yellow on white postal stationery postcard. Fine unused. H&G 3. 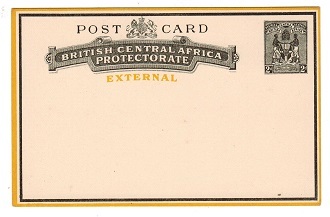 NYASALAND - 1893 2d 'External' PSC unused. H&G 2. 1893 2d Red on white 'External' postal stationery postcard in fine unused condition. H&G 2. 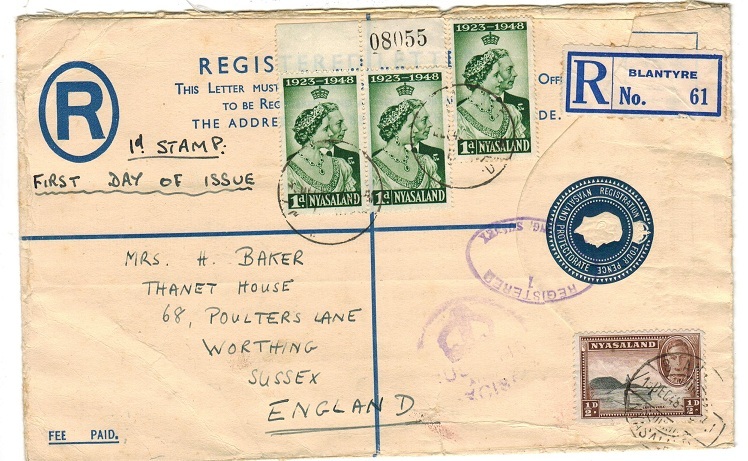 NYASALAND - 1933 OHMS stampless cover to UK used at BLANTYRE. 1933 (FEB.22.) long O.H.M.S. manilla stampless envelope addressed to UK cancelled by BLANTYRE cds with oval cog wheeled REGISTRAR OF THE HIGH COURT/BLANTYRE NYASALAND cachet at lower left corner. NYASALAND - 1920 2d rate cover to Cape Town used at FORT JOHNSON. 1920 (17.9.) cover addressed to Cape Town bearing 1d adhesive pair tied by FORT JOHNSON/ NYASALAND cds. ZOMBA transit b/s. NYASALAND - 1938 4d RPSE used to UK from BLANTYRE. H&G 3b. 1938 4d dark blue on cream registered postal stationery envelope addressed to UK (a little worn around edges) marked 'First Day Of Issue' and bearing 1d 'Wedding' (x3) adhesives with pictorial 1/2d cancelled BLANTYRE/NYASALAND and dated 15.DEC.48. H&G 3b.